This piece is all about fun! I got out all the green/ blue beads in my collection that I like- a mix of 11s, 8s, 6s then added cubes, rice shapes, drop as well as some reds to mix it up a bit. 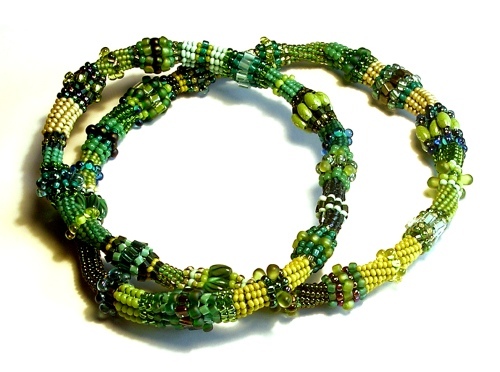 I then sat down and beaded! I simply changed colours when I wanted, added in what shapes, sizes etc that I felt would look good and went with the flow- sort of regimented freeform! It's a long necklace which just slips over my head to be worn- and as it has no clasp or visible ending it can freely slide around so the part people see is constantly changing.